Throughout history, Kayseri and its surrounding region has been a prominent trade centre at the crossroads of trade routes. Due to its volcanic lands, mountainous areas and mostly infertile soil, agriculture has always remained as an activity of secondary importance. The active role merchants from Kayseri played in the marketing of cotton produced in Adana also triggered the development of weaving and carpet production in the villages. The cosmopolitan make-up of its population enabled the city to become specialized in trade and paved the way for Kayseri merchants to be part of the global trade as of 19th century. 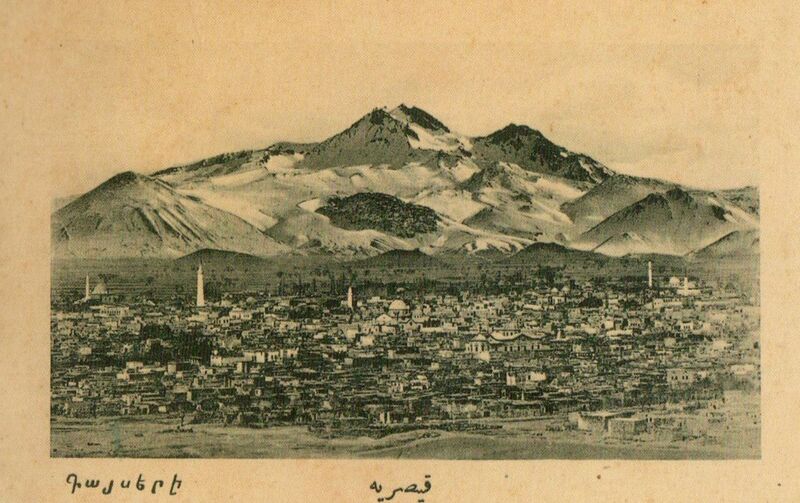 According to the 1914 census in the Ottoman era, Kayseri sanjak had a total population of 263,074. While the majority of the population was made up of Muslims (184,292 people, 70%), there were 26,590 Orthodox Greeks (10.1%) and 48,659 Armenians (18.5%). When the Catholic and Protestant communities of 3553 people (1.4%) are added to this picture, it is possible to argue that before the World War I one in three people living in the sanjak of Kayseri was non-Muslim. As a result of the formation of commercial networks, Armenian and Greek merchants opened up commercial agencies initially in big cities such as Istanbul and Izmir and subsequently abroad particularly in major trade hubs such as Manchester and London. Merchants from Kayseri served as the broker and distributor of goods produced in Europe throughout Turkey, especially in the sector of drapery. Amongst the merchant families originating from Kayseri, families of Gulbenkian, Gumushian, Ibranossian and Muradian brothers as well as Kochunian and Topalian brothers who opened up to the world from Gürün are the most prominent entrepreneur families brought up by the Kayseri market in the last century of the empire. Among Karamanli Greek merchants, Sismanoglou, Onasoglou and Kazancioglou families are also well-known as the notable merchants of Kayseri specialized in carpet and grocery business. The inclusion of business arithmetic, book keeping and accounting classes in the curriculum of non-Muslim community schools that were opened up in big cities, and teaching of foreign language to students, provided the human capital for the expanding commercial networks. One domain that reflects the wealth created by the Greek and Armenian merchants of Kayseri is buildings for public including churches, monasteries, orphanages and schools in the city of Kayseri, all commissioned by the leading figures of these communities. According to the study conducted in 2015, 113 such buildings were identified as commissioned by the Armenian community and 68 buildings identified as commissioned by the Greek community of Kayseri before the World War I. One of the most significant consequences of the World War I has been the change in Kayseri’s demographic structure: In 1915 Armenians of Kayseri were driven to Syria deserts and through the Turkish-Greek Exchange of Populations that took place after the signing of the Lausanne Treaty in 1923 Karamanlides – majority of whom were Turkish-speaking Greek Orthodox – were sent to Greece. As a result of the policy of ‘National Economy’ pursued by the government of the Party of Union and Progress during the war, ‘Kayseri National Economy Corporation’ and ‘Village Economy Bank’ were established in 1916, yet these companies were rather short lived. After the foundation of the Republic, public investments in Kayseri did increase in an effort to reinvigorate the economic life. The étatist economy policies put into place in the wake of the Great Depression of 1929 did have their impact in Kayseri. First of all, in 1926, aircraft and tank factories were opened, as a heavy industry investment of the public sector. The railways reached over Kayseri in 1927. In 1935, Kayseri Textile Factory was established as an investment of Sümerbank. All these large-scale public enterprises in Kayseri have been determining factors in the modernisation of the city via state interventions. During the same period, many entrepreneurs from Kayseri migrated to trade hubs such as Adana and Istanbul and contributed to the boosting of economy in those places. As a region that was deeply affected by demographic, economic, political and cultural collapse both before and after the foundation of the Republic, Kayseri and its surrounding region do deserve academic interest. The story of Kayseri between 1850 and 1950 can also be seen as a summary of Turkey’s social transformation. Therefore, at this conference, we would like to particularly encourage and see international academic studies that address – in a comprehensive and critical manner – the ‘traumatic’ transformations Kayseri and its surrounding region went through and studies that are of ‘interdisciplinary’ nature. • The presentations are limited to 20 minutes in order to have time for the Q&A session and the discussions. • The conference will be streamed live on www.hrantdink.org. • We kindly ask the participants to indicate their need of support for transportation and accommodation unless these are covered by their institutions. • The conference will be of an ‘interdisciplinary’ nature. The conference is open to the participation of researchers from various disciplines including history, history of economy, anthropology/cultural studies, sociology, political science, architectural and demographics, who study Kayseri and its hinterland. • A selection of the papers to be presented at the conference will be published by the HDV Publications in the form of conference proceedings. • Researchers who would like to participate in the conference are kindly requested to submit a 250-word-long summary of their original papers by specifying the major references along with a 150-word-long resume that includes their birth date, undergraduate, graduate and PhD degrees, field of work, books published and information on the ongoing work by April 5th, 2019 with filling out the form below.